Remember my daughter Bria? She’s 10 now! As many of you may know, I am the proud mother of 5 awesome kiddos. I have 2 handsome boys and I have 3 beautiful girls. All 3 of my daughters have hair down their backs. Its unfortunate that I don’t know how to braid. My oldest daughter is now a middle schooler so we made the transition from her wearing ponytails and barrettes to a more big girl look. She now wears her hair straightened. I don’t do much to her hair except for the occasional flat iron in the morning. She learned how to wrap it up at night. Thanks to watching a million youtube videos on how to do it. She had been doing a good job maintaining her straight hair and once a month, I take her to the dominican salon for a wash, deep conditioning and a blow out. But today’s post isn’t about my oldest daughter. It’s about my middle daughter Bria. You remember Bria right? 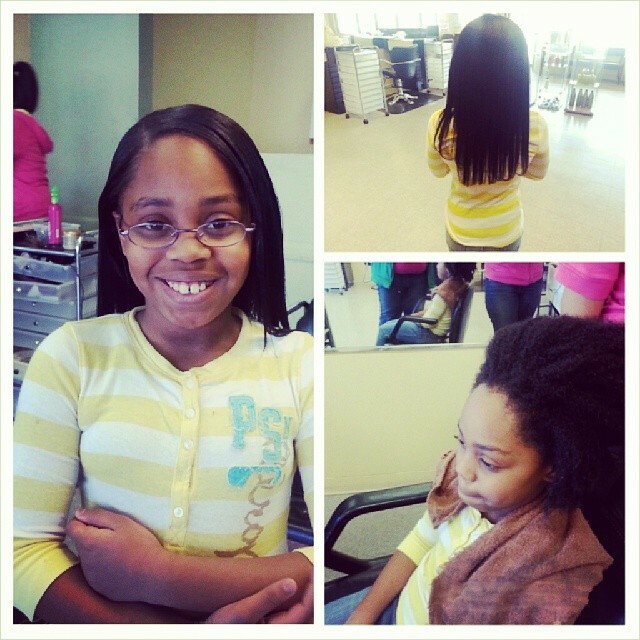 If not, I blogged about her 4c hair and her first experience getting it straightened for her 8th birthday. See blog post here. I cannot believe that it has been 2 years..wow. Bria turned 10 this week and soon she, like her older sister will be transitioning to more big girl hair styles. To celebrate her turning the big 10 she wanted to get her hair straightened. The first time she did not do so well, by the end of the day her hair was a semi poofy mess. This time around was much different. The first time we went to a um..well..let me see how to put this delicately..um..a sistah salon. No offense out there to black stylist or salon owners but it wasn’t the best experience and it was extremely expensive..I mean seriously I could have gotten my hair done 3 times for the price that she charged me. This time I took her to the dominican salon that I go to. Since my girl Somi doesn’t work on monday, another lady did it. She was really good and made sure that Bria was comfortable and that her hair was straightened. I am very pleased with the outcome. Not sure if she is going to keep wearing her hair straightened for now but we will see. I am not certain that I want to let go of the braids, beads and barrettes for her just yet. Here are the pictures. I’d love to hear from you ladies.